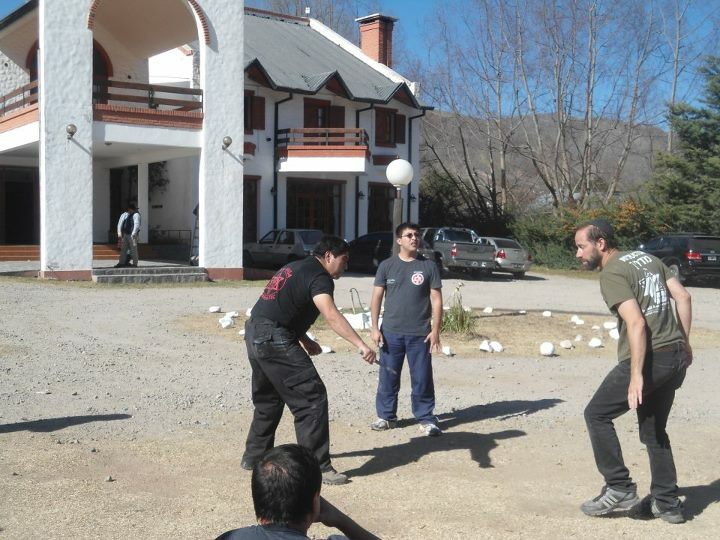 Moshe in Tucuman, Argentina, training with Ramon from Chile and students of Jose Nacul. The question of multiple attackers comes up frequently and has been addressed before in this blog, but yet, there is more to add. People often ask, "What is the Krav Maga technique for multiple attackers?" well the answer sheds a great deal of light about the nature of Krav Maga, at least the IKI way. People often want an exact technique for a given situation; they also want an exact curriculum for a certain rank or status. If you tell them that we don't work that way they often feel you are not serious, you just "make it up as you go along"; nothing could be further from the truth. In my book , "Israel, A Nation of Warriors" I discuss the Israeli mentality of improvisation and "thinking on your feet". This too can be viewed as "making it up as you go along without any serious plan". Of course the Israeli Defense Force (IDF) has a plan but as life teaches us - things rarely go as planned. When Egypt attacked us in 1967 they had a plan, it did not work and that was the end of it. When we defended we also had a plan, and that did not go perfectly so we improvised, and that my friends has made all the difference. Of course we have techniques, and plans, and strategies but we train ourselves to deal with what happens when things do not go as planned. Let us return to Multiple Attackers. We have some basic strategies (as you can see on our On Line Krav Maga program) but with this volatile and unpredictable situation it is better to have a basic concept of action and work from there. There are too many unknowns to make an exact plan. For Israelis this has become a way of life, most of us do not understand the word "No". To most Israelis the answer "No" means; OK, we have to think of a solution, lets find a way around this. When an Israeli soldier faces an impossible situation he thinks of a plan. When the same Israeli civilian is told in Europe that his flight is cancelled and he will not be home on time – he begins to think of a plan, a way around this "no" he just heard. I admit this can be frustrating for non-Israelis but when it comes to Krav Maga this is the way we do it. With multiple attackers there are many unknowns; how will they move? Do they have a strategy? Are there weapons involved? What we can give you is a basic strategy, a skill set to handle such situations, (the tools you need) and a real Israeli attitude. The rest my friends, is commentary. Come to Israel and train with Israelis, people who have grown in up in Israel and absorbed the Israeli way of thinking. Learn Krav Maga at the source, and have the time of your life while doing it. The program is designed for all levels, from beginners to Grand Masters, (yes, we have had a few of those). Everyone will walk away changed. Come prepared to ask questions, every topic will be covered.